Gloria Swanson sheds her glamorous image to play Tessie, a shop girl in the big city who just wants to have a little bit of fun. Her workaholic boyfriend (Tom Moore) is neglecting her in favor of an invention that could make his fortune so Tessie accepts an invitation from the smart set. However, she soon learns that all of the thrills and glamour come at a price. Gloria showed ’em how it was done. Swanson is interesting as a performer because her appeal does not really come through with still images. You can get kind of an idea of what Douglas Fairbanks or Mary Pickford or Charlie Chaplin were like based on stills but Swanson is a revelation on celluloid. Considered one of the most glamorous women of her time, photographs of Swanson are everywhere but to understand her enormous popularity, it is essential to watch her in motion. Swanson got tired of the super glamour roles herself and Manhandled was a conscious change of pace for her. In preparation for the film, she worked two days at a department store counter (heavily disguised) and took to chewing gum. The work paid off because Manhandled contains one of Swanson’s freshest and most appealing performances. Even stars need to have fun with their image once in a while. 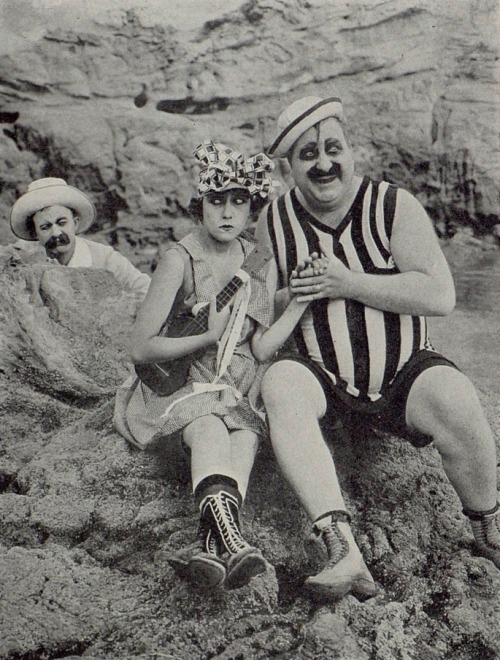 Gloria Swanson got her start in movies at Mack Sennett’s custard pie outfit. A self-described prissy teen, Swanson made a series of comedies with Bobby Vernon. (While she did pose in swimsuits, she was not a Bathing Beauty. That’s like saying the soprano was in the chorus. She was no more a bathing beauty than Mack Swain was.) Of course, Swanson found stardom under the direction of Cecil B. DeMille but she began to tire of her super-glam image. That’s where Manhandled comes into the picture. It’s the story of Tessie (Gloria Swanson), a department store employee struggling to get by. She is dating Jimmy (Tom Moore, brother of Matt, Owen and Mary Moore), a mechanic who is perfecting an invention that should make his fortune. It’s a doohickey that will dramatically increase fuel efficiency in autos. (Where can I buy it?) Until it’s finished, he has no time to go out with Tessie. Tessie is a normal young lady and she just wants to go dancing or maybe catch a cheap show but Jimmy doesn’t even have time for that. Her best friend and fellow shop girl, Pinkie (Lilyan Tashman), supplements her salary by hanging out with the smart set and charming lavish gifts out of the gentlemen. One of those gentlemen, Chip Thorndyke (Arthur Housman, best remembered today for his drunk act in Laurel and Hardy comedies), spots Tessie and asks Pinkie to bring her along to the next party. Tessie really just wants to go out with Jimmy but he is so absorbed in his work that he forgets that he had agreed to a date. Tessie decides to take Pinkie up on her offer. Pinkie means to paint the town red. Tessie doesn’t quite fit in with the wealthy and pretentious crowd but she gets attention from several gentlemen. Chip Thorndyke is buzzing around, an artist named Robert Brandt (Ian Keith) wants Tessie to be his model and Arno Riccardi (Frank Morgan) is more than a little interested. Tessie agrees to model for Brandt over Jimmy’s objections. After all, a gentleman like Brandt couldn’t possibly have any untoward motives. Right? Will Jimmy finally make time for Tessie? Will Tessie wise up about these rich guys? Or is she destined to be manhandled? Chip prepares to make his move. Of course she isn’t! You see, the Hays Code had come to Hollywood and while it was winked at more than obeyed, it still made studio heads nervous. In fact, the title Manhandled was meant as a bit of a dig at the code itself, which forbade such things. However, that doesn’t mean that Tessie keeps herself out of trouble. Swanson wrote fondly about the film in her autobiography. She and director Allan Dwan delighted in thinking up fun ways for Tessie to express herself. Swanson wrote of performing a Chaplin impression during one of the party scenes but that sequence was not in the print that I viewed. One issue I had with the film was how easily Jimmy gets off. He becomes quite jealous of Tessie’s new friends and begins to suspect that she is cheating on him. But the fact of the matter is that if he had made a little time for Tessie, she wouldn’t have gone out with Pinkie. All work and no play, Jimmy, all work and no play. In general, though, this is a cute romantic comedy that gives Swanson plenty of ways to express her comedic talent. A particular highlight is at the beginning of the film. Tessie is returning home for work and has to literally battle her way through the crowds in the subway. So I guess there is manhandling in the film after all. Another highlight is when Tessie takes a job posing as a Russian countess to class up a joint. She is doing fine until a real Russian woman shows up and addresses her in what should be their shared language. Quick-thinking Tessie bursts into tears. They must not speak Russian! It reminds her of home! The tragedy! The tragedy! Manhandled is an ideal introduction to Gloria Swanson, especially if you have only seen her in Sunset Boulevard. Manhandled was released on DVD-R by Grapevine Video as a double feature with Swanson’s 1918 film Shifting Sands. Next PostNext What silent star are you? Take the personality quiz!